In In 1965, as a thirteen year old boy, I went to Butlins holiday camp in Filey, Yorkshire, with my father, as we had done the previous years. In the evening, he went to the dance hall for old time ballroom dancing and I headed to the hall that had the groups. 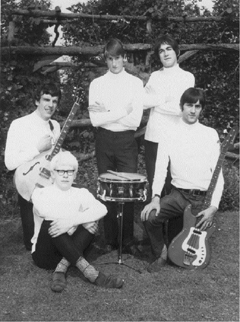 In 1964 it was Sandra Brown and the Boyfriends, but this year a band [Take Five] was on with a blond keyboard player [Chris Holmes]. As I was a budding guitarist, I watched the set every night for a week. After a few days, knew that, every night, the singer would announce that some of the band had to break for a pee. The guy playing the vibes stayed on stage with a couple of the others and put on the guitarist's guitar [I think it was a Gibson Les Paul] and played Booker T,s Green Onions for about 20 minutes. But he played the guitar upside down, without reversing the strings, and played brilliantly. This became the highlight of the night for me as I had never seen anyone play like that, or that good. In 1970/1971, I had just teamed up with Steve Dawson and we started to go to the Black Swan in Sheffield every Sunday night to see the bands. We saw Status Quo, Argent, Chicken Shack, Trapeze etc. But one Sunday, we arrived a little early and, at the bar, wearing a check sports coat, was the guy from Butlins! I said to Steve “F**k me. That bloke’s amazing on guitar!” This was, of course, Ollie Halsall with his band Patto, and they became regulars at the venue gig. Everyone hoped that Ollie would play more guitar, but sometimes he would mainly play the vibes - disappointing the guitarists in the audience. Some nights, they would just loon about all night, and some nights Ollie would just take off on guitar only stopping to kick over the vibes, encouraged by the rest of the band. 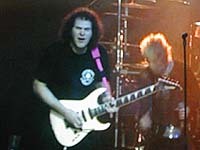 At some gigs the other Saxon guitarist, Paul Quinn, attended, but I did not know him then. He was, and still is, a huge Ollie devotee. Years later, when Saxon became successful, we were managed by Nigel Thomas, who told us stories about his involvement with various members of Patto and, later, Boxer. In fact, Biff Byford [Saxon bassist] bought a Fender Mustang bass off Patto bassist, Clive Griffiths in 1977/1978. When we toured the USA, Quinn always took a couple Patto cassettes and played them to guitar players on the tour. On one occasion we had Ozzy as our support and we were hanging out a lot with the great Randy Rhodes, talking guitars. Quinn said “Listen to this,” and played Loud Green Song. It blew Randy away and turned him onto Ollie in a instant and he copied the tapes for himself. As Saxon fans know, I used a white 1969 Gibson SG, bought in 1974, for most of my career and still have it this was because Ollie had one. Ollie once told me he pretended to play sax on his lead breaks. I consider myself lucky to have seen him.